Summer is near and the time has come for our Annual Boston Community Outing, “Boston Outdoors”, where we work up a sweat, network and conquer the northeast’s greatest landmarks together. Our familia will be hiking the skyline loop which offers a sensational view of the Boston skyline, and we want you to see it with us. 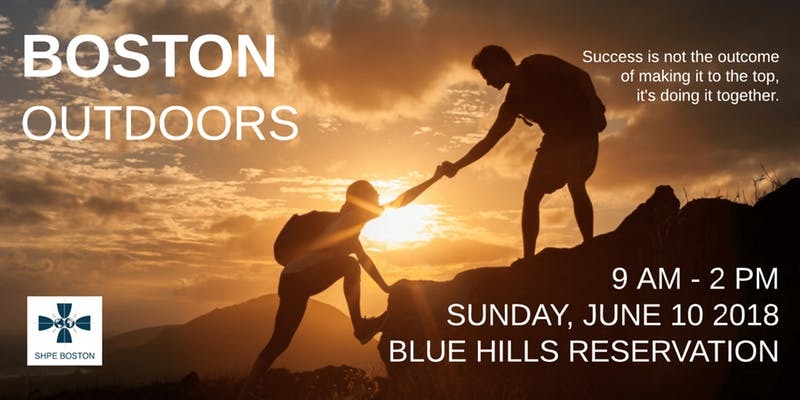 We are welcoming members & supporters of all ages to join us on our hike up our cities Big Blue Hill. What if it rains? : Rain date is the same weekend. Saturday, June 9, 2018 from 9 AM – 2 PM. We will watch for weather. Where we Meeting? : Reservation Headquarters, 695 Hillside St., Milton. Parking available across the street. What to Wear? : Outdoor clothes. Why Register? : We are planning to bring snacks and drinks to accomodate our registered guest. Food Restrictions? : If you are registered and have a dietary restriction please contact saul.garcia@shpeboston.com. On this popular trail, you can climb several summits within the Blue Hills range, including Great Blue Hill—the tallest peak in Blue Hills Reservation, which offers a commanding view of the Boston Skyline. The blue-blazed Skyline Loop Trail begins behind the park headquarters. Take the stone steps up Hancock Hill and follow the winding footpath over the ridge line to Eliot Observation Tower, which sits atop Great Blue Hill. Climb the tower for a panoramic view. To return, cross over the stone bridge to intersection #1066, and turn left to return via Skyline south. We will be bringing complementary snacks and drinks for our registered guest but it will be first come first serve so make sure to bring your own goodies or lunch bag.